Bi-directional accuracy of +/- 1% to 100% of capacity in Track and Peak modes meets or exceeds requirements of ASME B 107.300-2010 and ISO 6789. The Residual mode assists the user in determining retained Torque on a Joint. The accuracy percentage is contingent upon condition and user technique. Programmable Limits and a Yellow/Green/Red illumination system guide you as you use the Wrench. The display and a raised lens on the back of the Wrench illuminate when each significant Torque value is reached. An LED provides a Yellow/Orange light as you approach the minimum specification. The light turns Green when you reach the minimum Torque, and remains green until you either stop pulling on the Wrench or the maximum Torque specification is attained. If you overtorque, it turns bright Red to let you know. Just pull to Green! Audible prompts from a beeper supplement visual information. Exacta® 2 comes with a serial cable for communication with a PC. Simple front panel programming. Four keyswitches on the front of the Exacta® 2 electronics module permit programming and operation of all key functions. 999 memory locations can be accessed, reviewed, uploaded and printed - all from the front keypad! Free Exawin software for programming Exacta® 2 from a PC. Four of six models have the S/R Dovetail and can be used with S/R Interchangeable Heads. The Exacta® 2 uses four (4) AA NiMH batteries of 2200 mAh capacity. These batteries (sold separately with 5-minute charger in NAFTA countries only) provide ample operating time between charges. Backup batteries (NAFTA countries only) are available with 2500 mAh capacity. Comes with free ISO/IEC 17025 calibration certificate. Wrenches calibrated for use with heads having 3 7/8'' Common Centerline. Please note: Use only NiMH 1.25 volt rechargeable batteries in your wrench. Using 1.5 volt alkaline disposable batteries will damage your wrench, create inaccurate readings, and VOID your warranty. Weight: 3.1 lbs. / 1.40 kg. 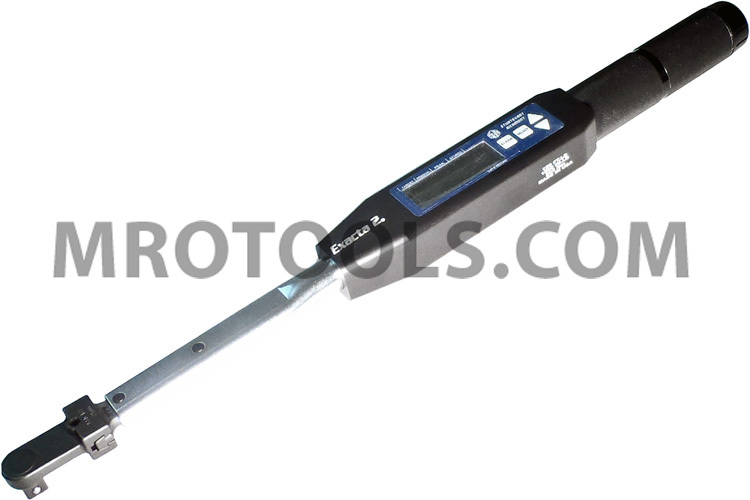 Description: 150 ft.lb, 203.3 Nm cap., 1/2'' SD Int Head inc.
Sturtevant Richmont Exacta® 2 Digital Series Torque Wrench. Model: Exacta 2 - 25 Lever Lenght: 12.5'' / 317mm Overall Lenght: 16.1'' / 409mm Weight: 2.8 lbs. / 1.27 kg. Description: 25 ft.lb, 33.8 Nm cap., 3/8'' SD Int Head inc.
Sturtevant Richmont Exacta® 2 Digital Series Torque Wrench. Model: Exacta 2 - 75 Lever Lenght: 15.8'' / 401mm Overall Lenght: 19.4'' / 493mm Weight: 3.0 lbs. / 1.36 kg. Description: 75 ft.lb, 101.5 Nm cap., 3/8'' SD Int Head inc.
Sturtevant Richmont Exacta® 2 Digital Series Torque Wrench. Model: Exacta 2 - 250 Lever Lenght: 21.0'' / 533mm Overall Lenght: 25.2'' / 640mm Weight: 4.1 lbs. / 1.86 kg. Description: 250 ft.lb, 338.9 Nm cap., 1/2'' Ratchetching Sq Dr.
Sturtevant Richmont Exacta® 2 Digital Series Torque Wrench. Model: Exacta 2 - 600 Lever Lenght: 55.1'' / 1399mm Overall Lenght: 59.7'' / 1516mm Weight: 13.0 lbs. / 5.90 kg. Description: 600 ft. lbs., 813.4 Nm cap., 3/4'' Ratchetching Sq. Dr.